"Where am I?" Azerbaijanis walking down the streets of Baku must be wondering these days. After living in isolation behind the Iron Curtain for 70 years and being cut off from the international community, walking down the street must feel like being transported to another world on a flying carpet. Baku no longer looks like the city it was just six or seven years ago, not only because there has been a face-lift brought on by sandblasting and reconstruction, but evidence of entrepreneurial commercial activity - stores, shops and street vendors - has sprung up all over the place. It's not just that stores are popping up everywhere or that the principles behind naming them have changed - evidence of shifts in language and alphabet usage is widespread. One of the first acts of legislation carried out by Azerbaijan's Parliament after the collapse of the Soviet Union was the adoption of a modified Latin script on December 25, 1991, only a few weeks after Azerbaijan gained its independence. 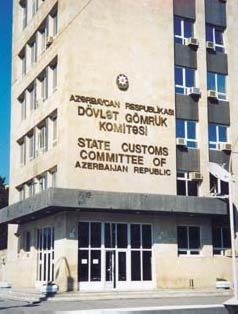 A new Constitution ratified in 1995 made Azeri the single State Language, instead of sharing the position with Russian, which was the case during the Soviet period. In reality, Russian used to be the more prestigious language because anyone hoping to advance in society had to master it. 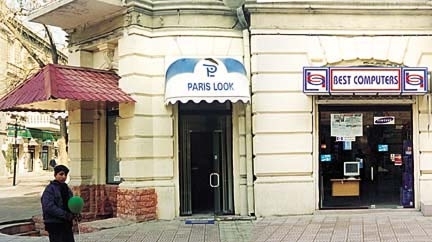 Ten years ago, store signs in Azeri (Cyrillic) and Russian were often found in juxtaposition. Today, many stores - and in some areas, the majority of them - have foreign names and use neither Azeri nor Russian. At first glance, this jungle of languages and scripts might seem anarchic. But, in fact, as is true of many small nations, especially those on trade routes, it is not a new phenomenon. Azerbaijan historically has always been characterized by its multilingual approach to communication. Azerbaijanis felt it was required, especially since they are mostly surrounded by larger political neighbors - Iran, Turkey and Russia. But these days, English is visibly butting its way onto center stage. The young people in Azerbaijan are generally excited about these new possibilities; the older people display tolerance, though more and more, they're beginning to express their discomfort to the extent that Parliament is discussing whether it should impose new laws regarding store names. To date, Azerbaijan has no laws that restrict the naming of stores. But now they're examining whether they should require all store signage to be in Azeri Latin or possibly that any foreign names used would have to be subordinate in size and placement to the Azeri. Early this year, we explored some of the city blocks around Azerbaijan International's Baku office (7 Alizade Street near Fountain Square) to see what we could learn about the usage of the Azeri language and alphabets based on the present array of store signs. We made a survey of the store signs on four major Baku streets: Nizami, Samad Vurghun, Rasul Reza and Khagani. We studied the signage of 61 different stores, noting the languages and scripts that each sign was written in. We found many stores with signage in multiple languages, including Turkish, Russian, French, Italian and, of course, English. As for store names in Azeri, however, the resounding question seems to be: Why are there so few? During the Soviet era, store names in Azerbaijan were known by generic names. Most stores were run by the government, and each one was assigned a generic category and number - not a personalized name of its own. A typical street would have shops with names like Drugstore No. 6, Jewelry Store No. 40 and Bakery No. 47. Often, the Azeri Cyrillic store names would be translated into Russian for the benefit of non-Azeri speakers. A bakery would therefore have a sign in Azeri Cyrillic that read "Chorak" and a Russian sign that said "Khleb". But very few of these numbered stores exist today. After Azerbaijan gained its independence, this bland uniformity was replaced by a wide variety of names, languages and alphabets. As the private sector grew, more and more entrepreneurs opened their own privately owned stores, personally choosing the names they wanted for their businesses. Foreign companies also entered the marketplace, bringing with them brand names that were already established throughout the world. The other two stores with Russian names are Video Mir (19 Rasul Reza), meaning "Video World", a small video and audio equipment shop, and Ivanovka (56 Nizami), which indicates that it sells "Agricultural Products", in both Azeri Latin, " " and Russian, "Selkhozprodukti". The predominant language, by far, is English. Approximately 40 percent of the stores in our survey use English as their primary store name. Often, these stores have additional signage in Azeri Latin to describe what they sell. Some of these English names speak for themselves (that is, if you know English): Best Computers (81 Nizami), Supermarket Continental (68 Nizami) and ABC Audio Video Center (81 Nizami). More elusive are names like Darling (5/9 Samad Vurghun), Enjoyment (50 Nizami) and Fan (52 Nizami). Albatross (60 Nizami) is a fairly large store selling primarily Turkish goods. Notices in the windows indicate that a sale is going on - Endirim (Turkish), Skidki (Russian) and Sale (English). Elegant (23/6 Rasul Reza) sells silverware. There seems to be a class of names that has entered international vocabulary through Italian or Latin. Maestro (77 Nizami), is a small store where video and audio cassettes can be bought or rented. Podium (13 Samad Vurghun) is a major fashionable clothing store. Signs on the door are written in Russian, Turkish and Azeri Latin. Antiquary (26 Rasul Reza) sells antiques and souvenirs. Bambino (13 Samad Vurghun) is a fairly large store featuring baby clothes. Stores with French names tend to suggest romance. Their products target women shoppers. For instance, L'Amour ("love" in French) (77 Nizami) sells wedding dresses. Below the name of the store is a sign in Azeri Latin that reads: " " (Modern wedding dresses to your taste). La Parfumerie (58 Nizami) sells high-quality perfume from Paris. Papillon (81 Nizami), meaning "Butterfly", sells cosmetics, though the store is closed and seems to be under reconstruction. All comments about products are in Russian. The one exception to the romantic motif in French names is the humorous name "2 Suisses Le Chonchon" (21 Rasul Reza), which the store attendants said means "two chubby Swissmen". It sells souvenir items. Numerous stores go by Turkish names, many of them related to women's clothing, such as Jansu (77 Nizami). A stationery store calls itself Bilgin Kirtasiye (81 Nizami) meaning "Knower Stationery". An explanation in Azeri Latin reads, " " (Stationery and Office Supplies). Many of the larger stores in Baku have names that correspond to clothing brands or appliances that are known internationally. Sony (68 Nizami) offers audio and video equipment, and Adidas (66 Nizami) features sports clothes. Salamander (77 Nizami) sells Italian-made Salamander products, such as leather shoes and bags. Similarly, Rodi - a Turkish store (56 Nizami) selling jeans and other clothing - is named after a jeans company in Turkey. TEFAL (81 Nizami) a French brand name, sells kitchen utensils and appliances internationally. Some of the store names that seem easiest to remember are those that contain only a few letters, such as VIP (7 Samad Vurghun), meaning "very important person" in English. However we discovered that other such letters usually referred to someone's initials. For instance, KIP (26 Rasul Reza) stands for the initials of the store's owner, who is Turkish. An Azeri women's clothing store, located at 53 Rasul Reza, goes simply by "F". Curious about such a short, enigmatic name, we stepped inside to learn more. A shop assistant told us that "F" refers to the first letter of the store owner's name. Another set of initials at 77 Nizami Street - "RK" - was just as perplexing. Inside this Indian-owned clothing store, we learned that the initials refer to Raj Kapur, a famous Indian actor. Often stores are given female names. One such store is the fashionable women's boutique named Ziba (66 Nizami). Ziba is a common female name of Persian etymology meaning "beautiful". Another store owner uses "Nadias" as the store name (56 Nizami), explaining that this is the Italian variant of her own Russian name, "Nadejda". She sells Italian-made clothing. Since so many of the store owners give their businesses foreign names, Azeri Latin tends to get second billing. Few stores (barely 20 percent) use Azeri as the primary name and even fewer (11 percent) list it in second or third position. Azeri is most prevalent among smaller shops like grocery and clothing stores. Exceptions include the supermarket named Tijarat Markazi (56 Nizami), which means Trading Center. The Azeri Latin names include (50 Nizami), meaning Sympathy Men's Wear, a store that sells shoes, clothing, perfume and cosmetics. (56 Nizami), meaning Trade Center, is a sizable supermarket. Xaqan (14 Samad Vurghun), a male name meaning "khan", sells audio and video equipment. (60 Nizami), meaning Youth Wear, sells clothing and has its store notices in Turkish and Russian. We noted a tendency for stores with Azeri in their names to combine the Azeri with another language. For example, Bahar Collection (77 Nizami) sells clothing for men and women. "Bahar", the word Azerbaijanis use for "spring", is also a female name. Combined with the English word "Collection", it takes on a quasi-foreign effect. Parvin Moda Italiana (64 Nizami) is another example of combining Azeri with another language - in this case, Italian. Parvin is primarily a male name in the Azerbaijan Republic and a female name among Southern Azerbaijanis living in Iran. Farid Market (54 Nizami) combines the Azeri male name Farid with the English word Market. It sells food items. A sign near the entrance reads "Segodnya v Prodaje," meaning, "Today on Sale"; the names of the items for sale are all in Russian. In at least one case, we found the Azeri Latin to be misspelled. A food store on 68 Nizami calls itself " ", which is the Azeri word for "food products". The spelling should have been through "q", not "g" for " ". (These two letters are often confused in Azeri Latin.) The misspelling may seem like it would be obvious, but the store's employees had not even realized it. Out of the 61 stores, only one has its name written in Azeri Cyrillic - a stationery store - Daftarkhana Mallari (14 Khagani) The owner explained, "I have no desire to change my sign to be Azeri Latin. Many of my older customers can only read the Cyrillic script. I like it better than the Latin, since it's the alphabet I was educated in and grew up using. Besides, it costs a lot of money to change the sign." He has a point, of course, which is obviously shared with many older residents of the city. Even scarcer than Azeri Cyrillic is the Arabic script. Even though there is a considerable amount of trade going on with Iran, and many Iranian products are sold in Baku stores, store names rarely use Arabic script simply because very few Azerbaijanis in the Republic are able to read it. Arabic was used in the region now known as the Republic from the 7th century up until 1929, when Stalin did his best to eradicate the script by organizing book-burning campaigns because of its associations with Islam. It seems he succeeded. Of course, Azerbaijanis in Iran (which number an estimated 25 million) are very comfortable with the modified Arabic script, which is used for Persian and serves as the official script there. Though this proliferation of languages and scripts may be viewed as progress and international engagement by some people, it is equally unsettling to others. Clearly, it shows Azerbaijan's openness and willingness to embrace the international community, especially the West. In the marketplace, products that come from or refer to the West are considered to be more prestigious, regardless of their quality. 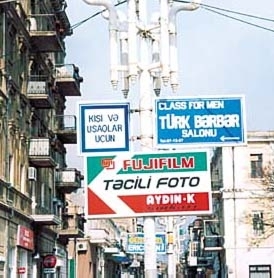 The adoption of the Latin script in Azerbaijan obviously enables many of its citizens to bridge into other Western languages and thus read signs and product names written in many languages. 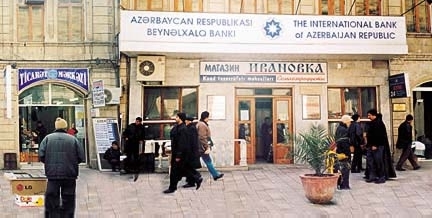 At the same time, these foreign influences seem to run counter to the interests of Azerbaijan's own fledgling alphabet. During Soviet rule, the Azeri language was secondary to Russian. If you wanted to succeed and gain social and economic status, Russian and Cyrillic were fundamental. It was impossible to do it any other way. Now Azeri is having to contend with international languages, especially English, even to the point of having to compete with them on its own streets. It seems, though, for the Azerbaijani language to flourish, commercial interests will also have to support it. The question remains whether this can be done on a voluntary basis or whether it needs to be legislated.